I feel like things are just moving way too fast for me to handle these days. When you have a lot of things going on, it is just natural. That’s why I wish to take some time to myself and unwind with some games on my Android, as it helps me forget about my tensions. I’m a fan of space battle game that keep my mind stimulated, and also I grew up with them. 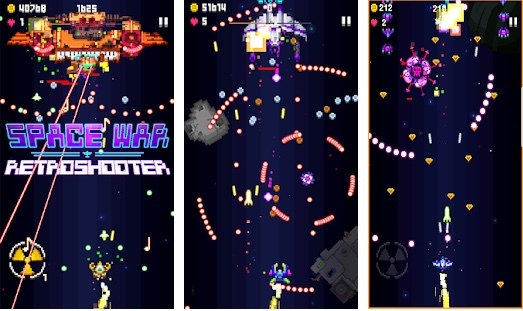 When I saw Space War – 2D Pixel Retro Shooter by SHMUP HOLIC on the Play Store, I was intrigued, as I love space battle game. So are you ready for a classic Arcade shmup gameplay then Space War is the ultimate space battle game rendered with 2D pixel graphics that would perfectly hook every retro-nostalgic into its arcade gameplay. The players can easily control a plane and should travel through several hostile alien planets. You can use your dexterity to fend off incoming dangers and keep shooting down everything that moves. It is illustrated that you can use Play the Arcade mode by advancing from level to level, or unlock the Boss-battle mode to fight only the bosses and unlock special planes. The major question would be can you defeat all the bosses? 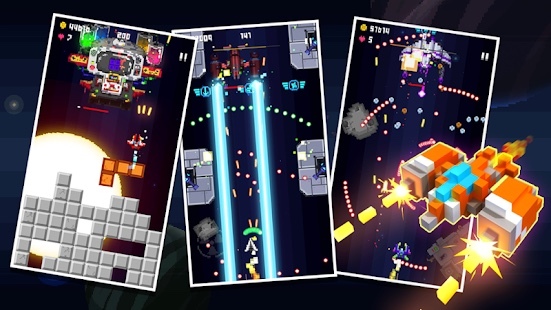 Shoot’em up Gameplay – This Space War efficaciously features a classic shmup arcade gameplay where you must use your spaceship to destroy hordes of enemy ships and bosses. You can simply guide the ship and it will shoot automatically. Multiple fighting planes – There are over 30 different planes to select from and start blasting enemies. You can start with your grandpa’s old plane and use collected coins to unlock more powerful ones. It is also possible to unlock special planes by defending bosses. Upgrades & power-ups – During play you can pick up several power-ups that assist you to shoot faster, more powerful or protect you. You can also collect nukes to blast whole areas and use in-game coins to buy upgrades namely for your shield, gun, bomb, magnet. Lots of difficult levels – You have 8 different planets to unlock, each with multiple levels that would keep you hooked for hours. Every time you lose your lives, players must start over and replay those levels. They must also face 8 EPIC boss battles. Beautiful 2D pixel graphics- Space War adeptly features beautiful pixel-perfect graphics that would bring out the retro-nostalgic in you. It is also accompanied by an original soundtrack to assist you immerse in the action. Finally Space War – 2D Pixel Retro Shooter is a special title I’ll be coming back over again in the future, and I suggest it for anyone who thoroughly enjoys a challenging game. Since shooting is so cool and one can widely enjoy the variety of shooting games from SHMUP HOLIC!